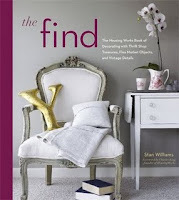 The Gift of Thrift: What's Cooking? One of my favorite pastimes is perusing old recipes and taking in all of the once-popular ingredients, such as Jello, oleo, maraschino cherries and fruit cocktail. On a very rare occasion, I still let a bit of Velvetta cheese or Campbell's cream of mushroom soup creep into a dish, and for all the snickering and upturned noses they induce in toney New York "foodies," these creations are always the ones gobbled up lickety split. Every Christmas my sister excels at giving me the best Gifts of Thrift, usually delightful old cookbooks with Technicolor photos of jiggly green salads and unnaturally tanned poultry. 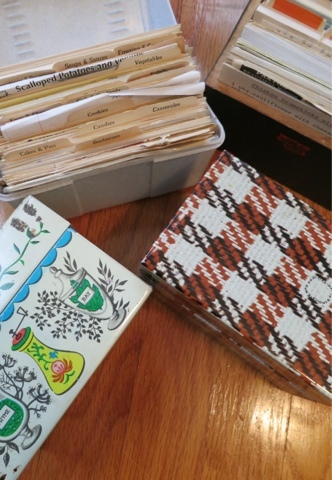 This year, she outdid herself: four boxes jam packed with recipes, most handwritten on 3x5 cards, complete with commentary. Several, like " Big Batch Salmon Casserole" and "Jelly Roll Salad," were given the distinction of "very good." Others, like "Rhubarb Salad" with cherry Jello were called out with "Ovle likes this." (I can only guess that Ovle was her husband.) But only two recipes in the batches were marked with the honor of being deemed "super": a seven-minute frosting and "Heavenly Pineapple Mold" made with lemon Jello, pineapple juice, cheddar cheese, and a cup of Dream Whip. The Object of My Desire: Hey Cookie! 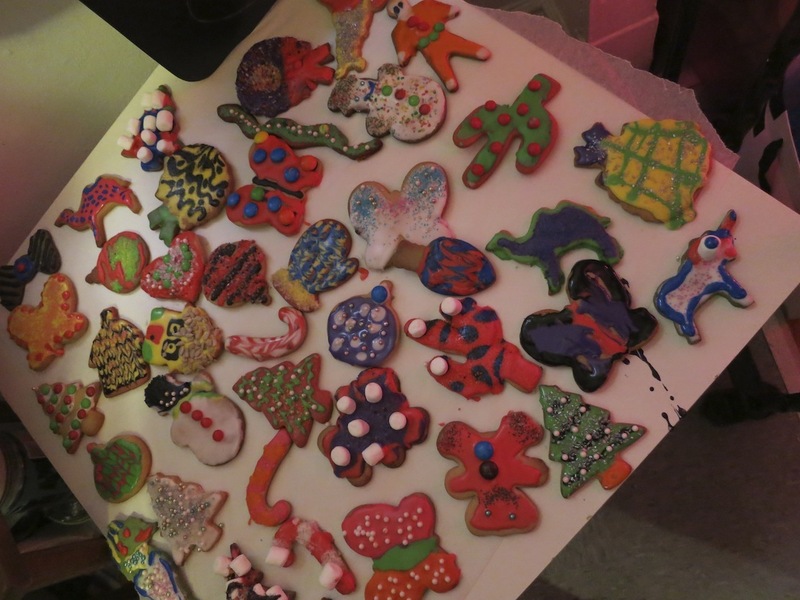 We went cookie crazy this weekend at our sweet friend's decorating party. Here is a small sampling of the results. (She told me she baked 36 dozens of these pretties in preparation for her gathering!) I, of course, turned what was intended to be a wreath into a holiday pineapple. Can you spot my kooky creation? 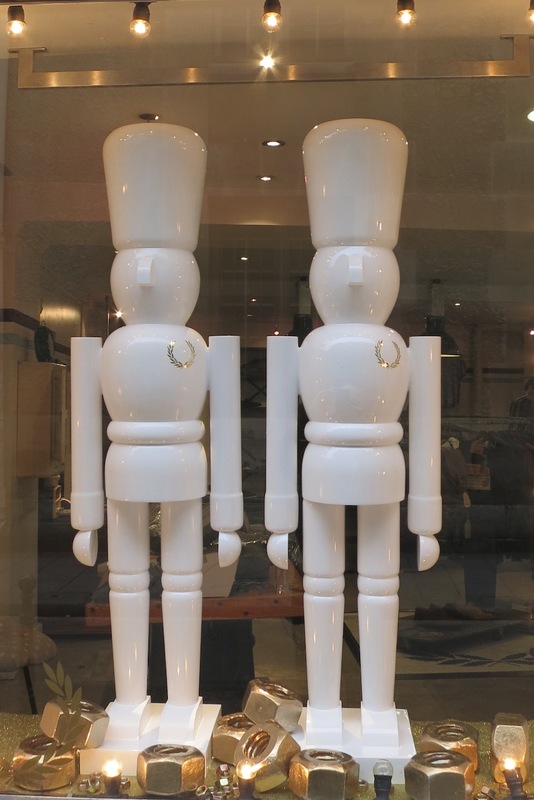 As you may know, one of my favorite places in the world is Paris. I've been fortunate to spend many wonderful visits there, and I can honestly say I've never found myself bored -- even once when I was there during a national strike that closed all the museums for my entire stay. 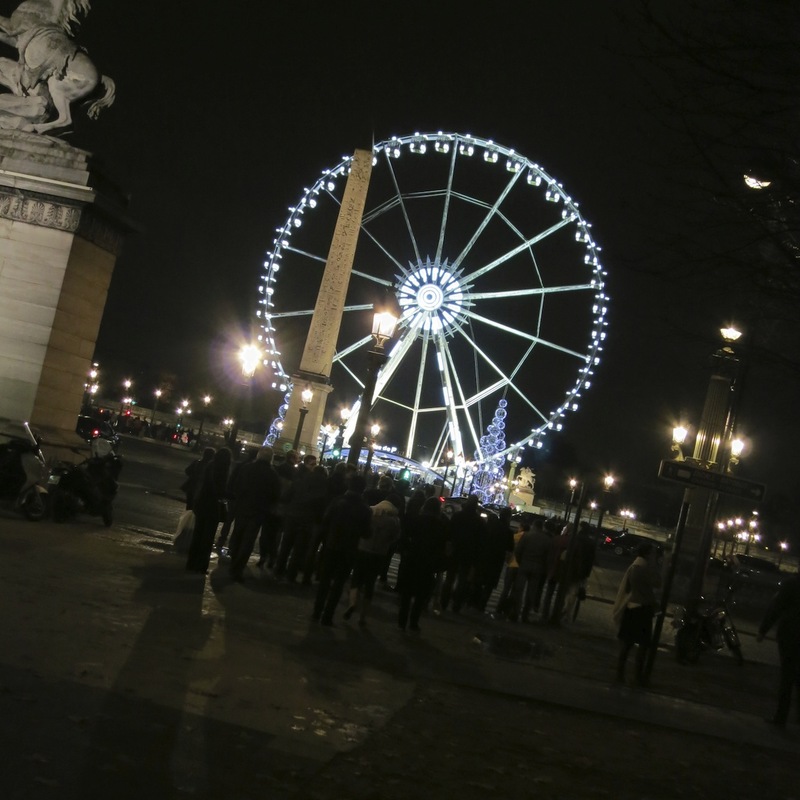 But it's images like the one above that always reminds me of why Paris holds a special place among my dearest memories. Where else would a teeny, tiny electrics shop -- big enough for only a Vespa inside -- with its wares so marvelously displayed in it vitrine? 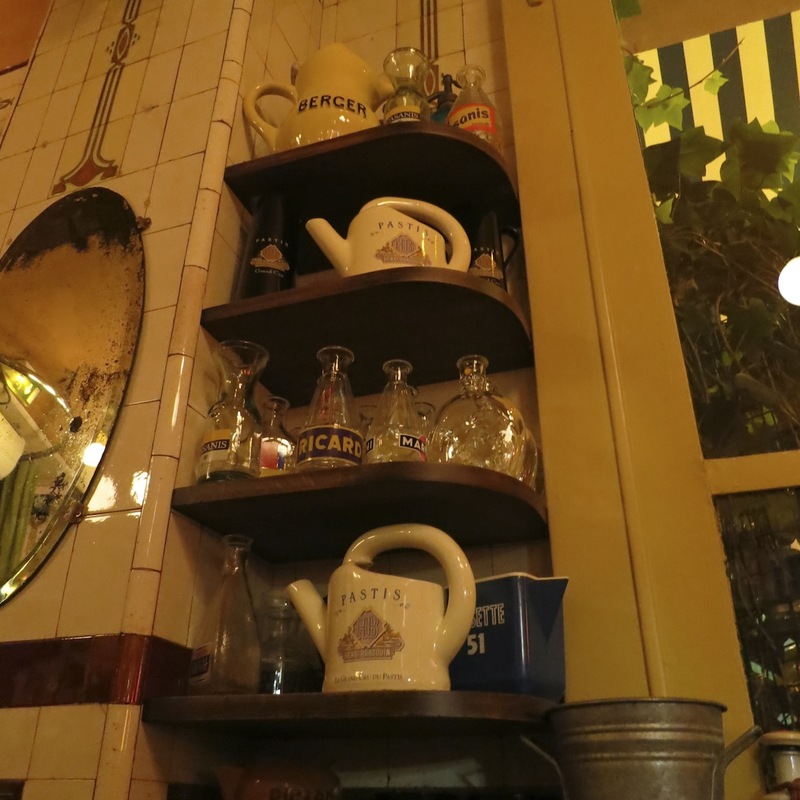 I discovered the Provençal restaurant Chez Janou, which prides itself in offering more than 80 types of Pastis. Here's a shrine to that region's drink of choice. My visit included several museums and a dash through the Christmas market near Place de la Concorde where I took in the view of the spectacular Ferris wheel. 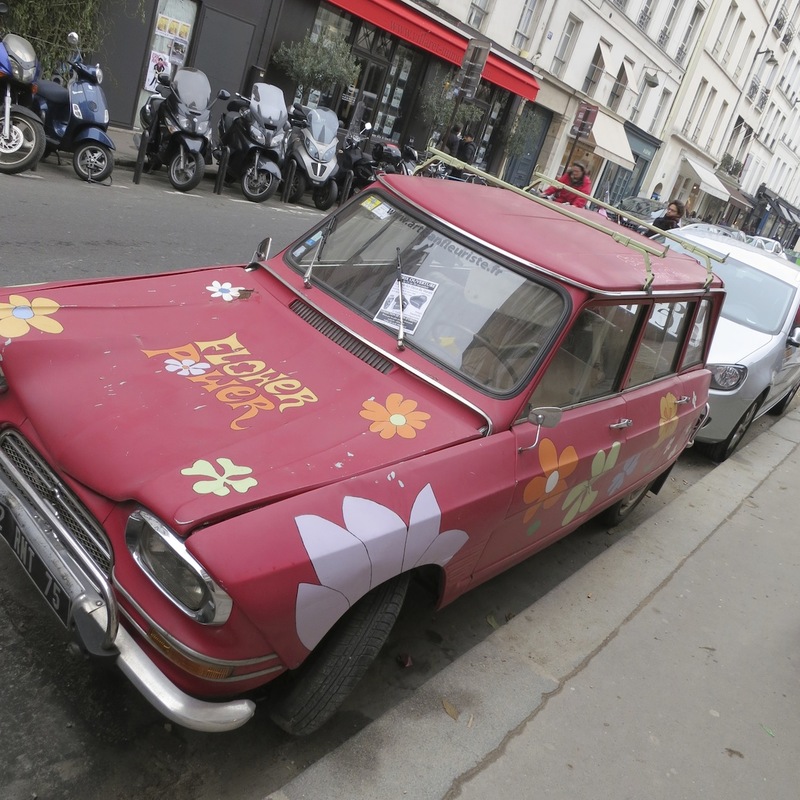 We also stopped at l'Artisan Fleuriste, a gem of a flower shop on rue Vieille du Temple in the Marais that advertises its far-from-typical florals on a vintage Citroën Ami 8. Just a few steps away, Brit menswear brand Fred Perry had extra-large nutcrackers on show to crack some very large nuts. 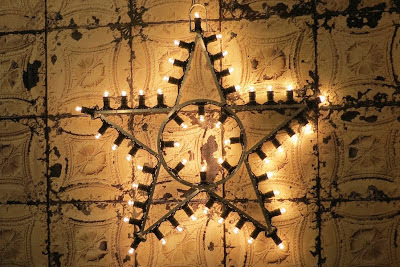 And back on boulevard Beaumarchais, a lit-up star was displayed on a wall covered with Brooklyn Tins tile wallpaper at the gracious shop of wonders, Merci . I wrote this post a while back and decided to share it with you again since its from one of my favorite locations featured in The Find. There's something irresistible about the simplicity of a beach cottage -- one practically under-decorated with finishes that have faded under the sun's constant caress and textures speckled and splotched by the salty air's kiss. 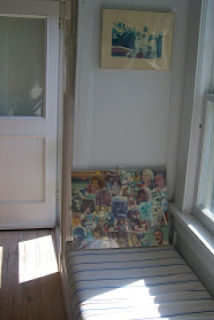 Since winter's chill is on the way, I thought I'd share a couple of the heartwarming images that I photographed on the Fire Island community of Saltaire while doing research for The Find: The Housing Works Book of Decorating With Thrift Shop Treasures, Flea Market Objects, and Vintage Details. Mary-Ellen Weinrib, a home stylist who has spent her summers on Saltaire for more than 20 year, took me on a tour of her home and I snapped away inspiration that I haven't shown anyone until now -- a framed poppy canvas casually leaned on the mantle of a weathered fireplace, an intimate view through a painted screen door into a crisp-white guest room, or even the lovely, washed-out family photographs that accentuate the setting of a brilliant sun porch. Even though people laugh at me for keeping it and the only people who reach me on it are robo calls and Citibank, my land line is still hooked up. Yes, I use my mobile phone as much as everyone else, and even my parents know that when they want to reach me they call the cell. That said, I can't seem break with the thought of having a line dedicated solely to making and receiving phone calls. The other reason I keep my hard connection is that even when all the power goes out, electricity still flows through the phone line. It only works in a power outage, however, if you have an old-fashioned phone where the handset is connected to a base with a cord; mobile models won't work. I learned this lesson well during Sandy when absolutely nothing worked for a week: no mobile, no Internet; no lights and no phone, since the one I was using connected remotely to its base. That's what sent me shopping on Etsy to find a phone that reminded me of the one I had in my bedroom when I was a teen. It was a model similar to this, except that it had a rotary dial. I saw plenty of those, too, but I decided to trade up to this model made by AT&T in 1989. This orange-ish relic from the past is now all hooked up in my bedroom and ready to ring, and unlike a mobile phone, it cradles nicely between the ear and the shoulder without burning my ear or cramping my arm.